For most people, writing in the English language takes a lot of expertise. There are some technicalities in writing that one must acquire to be able to come up with a logical and reasonable writing output. These technicalities include grammar, sentence construction, vocabulary and expressions, punctuation, and most importantly the coherence and flow of the ideas in the essay. In taking an English competency test like the IELTS or the International English Language Testing System examination, preparing for the writing exam is very crucial. If you are taking the Academic writing, you will have to interpret a given data, graph or process in an essay form making the writing a little technical and difficult. In the General Training, you will have to compose a letter based on a given situation; hence, knowledge on writing correspondence is important. With these in mind, preparation for the IELTS writing should really be made and done. For starters, when preparing for the IELTS writing, you could start by reading newspapers. Newspapers are good source of reading materials. They have varied styles of writing including formal news writing found in headlines or news beat and free writing style commonly used in editorials and lifestyle sections. 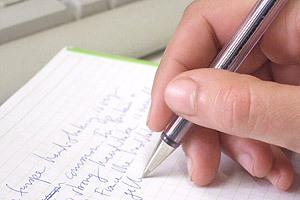 How will these writing be able to help you improve your skills for the IELTS? There are some good vocabulary words and very good expressions writers use in their articles. Being familiar with these is a good practice to widen your vocabulary bank. In addition, you will also have the chance to understand different word expressions that can be used to make your writing more intelligent and logical. Newspapers articles have the best sentence structures. Though they seem so complicated and a little difficult to understand, the sentences are all in good sentence construction. For candidates reading these, studying closely how sentences are constructed is the best way to practice for your own writing. News beat writing uses grammar well. The grammar construction is very consistent and the flow of ideas is superb. Hence, newspapers have highly paid editors to do the job. Newspapers are the best source of ideas when coming up with writing articles. In IELTS review centers, mentors also suggest reading newspapers as a good start for developing one’s vocabulary and sentence flow. For better practice on writing, it is advisable to enrol in an IELTS review center. Coaches provide writing practices and critique your essay. Trust these mentors for they are experienced in doing this. Thus, visit an IELTS review center today.